Solving a Rubik's cube can seem like an incredibly hard task. In order to solve the Rubik's cube, you should learn some of the fundamental algorithms that make it possible to solve the puzzle. An algorithm is a set of rotations that will allow you to strategically move squares without disrupting the rest of the cube. Algorithms will denote a side of the cube as it's facing you (R for right, L for left, F for front, B for back, U for up, D for down) and will tell you to turn it once either clockwise or counterclockwise (which is denoted by an apostrophe after the direction). Familiarize yourself with the cube. If this is your first time picking up the Rubik's cube, experiment with solving for one side without using any algorithms. This will help you understand the dynamics involved with positioning the squares and will make it easier to solve the first layer. Choose a color to start with. The center square on each side is that side's permanent color and can not change. Keep this in mind when solving the cube. Turn the chosen color's face toward you and manipulate the squares to make a cross-shape on that side. There is only one correct orientation for each cube, so ensure that the other four sides of the cross shape line up with their appropriate colors. Solve the corners of the first layer by turning that face upward and positioning the correct cubes in the bottom right or top right corner of the side that is facing you. 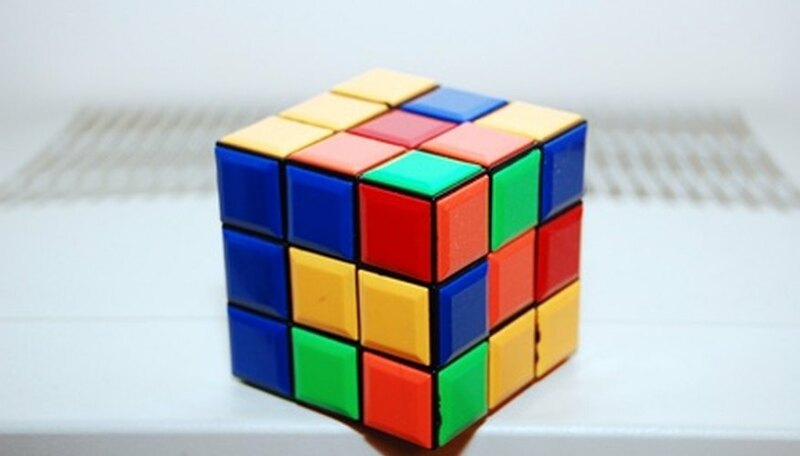 Use the algorithm R' D' R D to move a correct square from the bottom of the side facing you to the top where it belongs and to change the orientation of that cube so that the colored sides match up. Do this with each corner for the first layer. Turn the Rubik's cube upside down so that the first layer is now facing downward. Solve the second layer by searching for the correctly colored side squares in the top layer. Move them to the second layer by lining them up above the center of the side you are trying to move it to. Use the algorithm U R U R' U' F' U' F to move a square down and to the right, or rotate the whole cube to the right and use the algorithm U' F' U' F U R U R' to move a square down and to the left. Form a cross-shape on the top layer (paying no attention to whether or not the sides match up). Use the algorithm F R U R' U' F' multiple times until you have the desired shape. If you get an L-shaped pattern, position it in the top left corner of the top face before you perform this algorithm; if you get a straight line, position it horizontally before you perform this algorithm. Line the center pieces of the cross shape up with the correct colors on the four sides below it. Use the algorithm R U R' U R U2 R' while the correct colors are either facing to the right and away from you, or towards you and away from you. Use the algorithm U R U' L' U R' U' L to solve for the corners. Position the correct colored corner piece toward you and to the right when performing this algorithm. Orient the corner squares correctly by choosing a corner and using the algorithm R' D' R D until the square's colors match up. Keep the cube facing you and simply rotate the top layer counter-clockwise and repeat this on each corner until it matches. Write down the algorithms to help you remember when to use them.